Very cute pictures! Someone at your house was good at cake decorating! 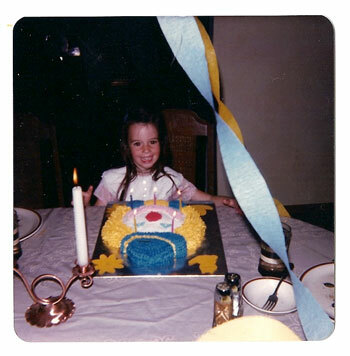 Your clown cake reminded me of my favorite birthday party- I think I was turning 5, and it was a carnival party with games like a peanut hunt, a sponge toss (at my dad, which all my friends thought was hilarious) and a fishing game. I remember me and my guests just running around the yard and just having a blast. I agree, your cakes were amazing! Did your mom make those?! My most vivid birthday memory was receiving a live Siamese kitten. One, because it was wrapped up in a hat box. and Two, because I don't know who was more shocked, the cat or me, but we both freaked out and ran! 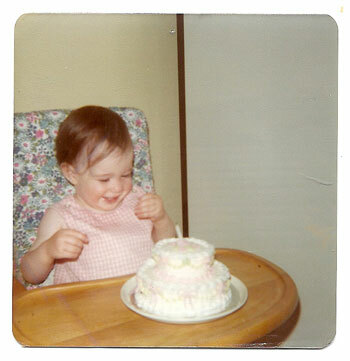 I have several birthday memories that stand out. The first is of my 9th birthday. Why do I remember? The gifts were great. I got Uno cards (to this day I'm only missing about 4 cards from the deck), the Guess Who game, a tote bag, and 2 or 3 Great Illustrated Classics. This was my first taste of Little Women. The other memory is about my Granny saving the day. My mom baked me a cake (with our last box of cake mix) and forgot to put the eggs in. Eggs are essential to cakes. I called Granny in a panic. She baked me another cake and saved the day. Happy Birthday! 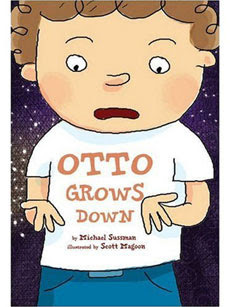 And thanks for your kind words about Otto. Here's a link to a story about a boy who who was inspired by Otto to throw himself a backwards birthday party! 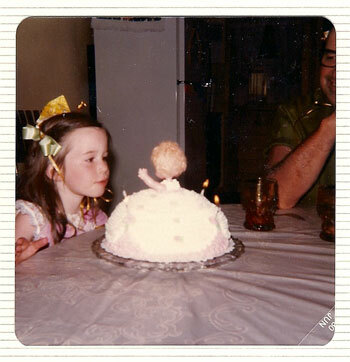 My favorite birthday memory is when my mom made me a doll cake. It was 3D. So memorable! I do love birthdays, mine is in two weeks! Two years ago my husband planned out a whole "Amazing Race" for me. My family and I hopped from place to place following clues. We hit all my favorite places, Cheesecake Factory, Barnes and Noble, Old Navy...it was awesome! B/day memory of mine...hmmm...I remember I was so excited to have a "doll" b/day party, where all of my little friends would bring their fave dolls and we would play house with them during my party. Well, nobody brought a doll...except me! Oh well! 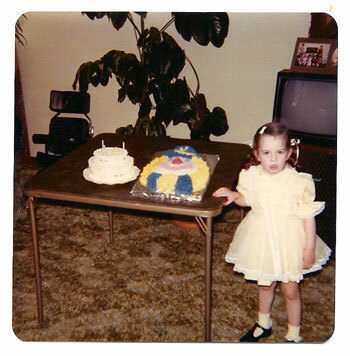 What adorable pictures - I love the doll cake! One of my favorite birthday memories is getting a cake with The Beatles done up in frosting on the cake! I subscribe in RSS reader. Cute b-day pics. A b-day memory I have is my dad telling me to go clean up the yard, and I was inwardly so mad at having to go clean the yard on my b-day - but I went outside, and there was a new bike sitting there. My best b-day was my 13th when I had a 50's themed party. One of my best birthday memories was from when I was 5 and my mom took me to the movies for the first time. I was so excited! This book looks so cute!! Thank you for the opportunity!! One birthday memory that I have was one where I was actually sick. Despite feeling icky, I had an awesome cake and still had a great day!! I'm already a follower by the way! At my 4th birthday party I was feeling brave until the boxer dog next door knocked me down. That led to a fear of dogs that lasted til I was 50. Not a fun memory but the one that always stands out. I remember my 10th birthday because I thought it was a big deal that I had two numbers in my age! 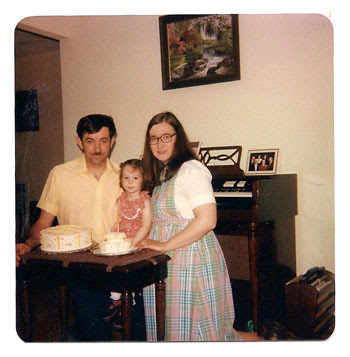 I remember my 3rd birthday and right before I blew out the candles I looked up at my grandfather and he winked at me. He died a couple of months later. I don't know why I remember that but I'm glad I have that one memory of him. One very special birthday I had while I was in grade school was a sleepover birthday party with my closest girlfriends and a chance to go shopping the next day at the mall with my birthday money. My mom made me a cookie monster cake. I loved it and it made my 8th birthday very special. My best birthday memory was the party I had when I turned 19. That's the first and only birthday party I've ever had in my life. All my best friends were invited over to have great food and fun games together. My best birthday memory is when I was 5 years old and my favorite uncle came back from Vietnam. We were all so excited to see him and he was happy and healthy! Of course, he got the biggest piece of my birthday cake!!!! I remember my father giving me a giraffe picture a friend of his took in Africa when I was 12 and I still have it on my wall. Wow - those are some really nice cakes in the pictures. I used to love lemon cake and my Mom would sometimes fix those for my birthday. Ralph Waldo Emerson was born in the month of May. I follow you on Twitter as @cakeblast and tweeted.. I'm not a big fan of cake, so my mom would make me a cherry pie and we'd put candles in it! My birthday memory that really sticks out was when I turned 30 years old. I lived in a city near my parents, and my dad knew the owner of the radio stations in both cities. Dad had them announce that I was turning 30 years old that day and that if the listener wanted to call me up and wish me a Happy Birthday, they had to call and they gave out my home phone number. I got so many birthday wishes from people that I did not know. It was actually kind of fun. My favorite birthday memory occurred during my last birthday when we went to Disneyland! My husband, kids, and I had so much fun! B-day memory: My husband took me to the NYC to see a Broadway show. But first, We went to a nice restaurant close by and when I opened the menu: It said, Happy Birthday to you Jennifer, we hope it's wonderful or something close to that. So I knew my husband put much thought into calling this place ahead of time because this was typed up very nice. It was too sweet! :-) This was I believe before we had children too. Would love to win the contest!! I follow you, and I subscribe. My favorite Birthday memory is going to Chuck E Cheese's and my little sister was afraid of the characters...lol! My Mom would always get me a Mint Chocolate Angel Food Cake from Bennison's Bakery for my birthday! 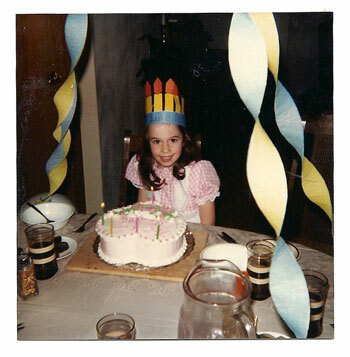 One of my favorite birthday memories was my grandmother making me a fireworks cake one year - it was so unique! I have an April birthday and up here in the Northeast the weather can be very unprdictable in April - snowy, rainy, muddy, or beautiful. I remember my parents renting the pool at a local hotel so I could have a pool party in April - and it snowed that year so it was even better. The hotel had a glass wall where you could see outside from the pool area, so it was like swimming outside - we all thought that was the coolest! I had a birthday party at McDonalds when I was little. I remember that my cousin blew my candles out and I was ticked off. One of my favorite Birthday Memories was my mom threw a suprise birthday for me when I turned 7. It was so fun to walk into a party that was mine. Author Marian Engel was born May 24, 1933. She wrote Adventure at Moon Bay Towers (1974) and My name is not Odessa Yarker (1977) which are children's books.